Streets of Paris, 1946, if in Fact, 2007, ink on paper, 31 x 25 1/2". Timothy Hull’s new paintings, drawings, collage, sound work, and “scent” meticulously revolve around representations of the early-twentieth-century European spiritualist G. I. Gurdjieff. Titled after the mystic’s book LifeIis Real Only Then When “I Am” (1974), this body of work proves to be a study of a cult persona that stops just short of fanaticism. In works on paper, Gurdjieff’s emblematic image—a dignified man with a handlebar moustache and an Astrakhan hat—is repeated, mirrored, silhouetted, traced, sketched, and decorated with horror vacui patterns and geometric diagrams. Other portraits depict the historical characters that surrounded Gurdjieff, including Katherine Mansfield Trying to Be Real, 2006, in which the modernist writer is rendered in a mask of inky lines. 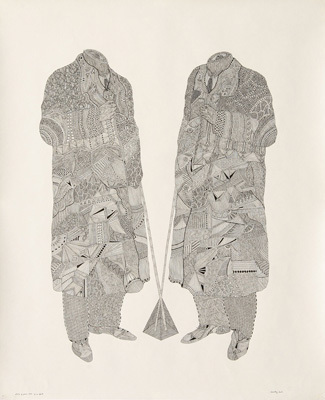 In nonfigurative works like Erwache (To Awaken), 2007, Hull presents runelike writing that suggests both esoteric symbolism and the rhetoric of spiritual awakenings. To underscore these images, Hull remixed and looped a recording of Gurdjieff’s harmonium music, creating a droning, ambient composition that suffuses the space. While the premise behind this work points to specific doctrine and the history of its reception, Hull’s use of Gurdjieff may be a bit misleading. Perhaps unintentionally, Hull’s stunning drawings seem to relate less to mystical concepts of reality than to the notion of false icons. In doing so, these exercises implicate loaded political slogans, Western imperialism, orientalism, and the inevitable marketability of New Age thought.